Are you in the process of optimizing your landing page and wondering if you’re missing anything? Sometimes it’s just a matter of using Landing Page Templates, but other times the smallest variables can make the biggest difference in your page's conversion rate optimization. So here are a few of those small optimization details that can make all the difference. I’ve pored over landing pages from all around the web (both B2B and B2C) to find the five ways that language impacts on conversions. Check out these five ways you can use language to convert your landing page traffic. You need to communicate value immediately and constantly in your landing page. Value is expressed in your USP, your value proposition (of course) but also your list of benefits and even your CTA. People respond unconsciously to tone in our daily lives. We meet somebody and for no reason we like them, or we don’t, based on the most minute physical and emotional cues. We unconsciously react to someone whose arms are crossed on their chest versus at their sides. We tend to trust someone more who sits confidently, with an open attitude, good posture, and a slow speech-pattern. Landing page are no different. In fact, the smallest change in your CTA (from demanding to offering value) can rocket your landing page’s conversion rates. These small changes will affect the tone of your landing page. When coupled with a personable, smiling (non-model) image, a USP that denotes value to your audience, and easy-to-understand benefits, your landing page will be friendly and awesome - and your conversion rates will reflect that. Well yes I am, random reader I just made up. Do people respond more actively to avoidance of a negative result, or to bringing about a positive result? This is something you need to test, because the improvement may depend entirely on your product, your audience, or even the individual words you use. I would genuinely recommend you A/B split test two USPs (unique selling propositions): one that frames your service in terms of positive achievement, and another that frames it in terms of negative avoidance. 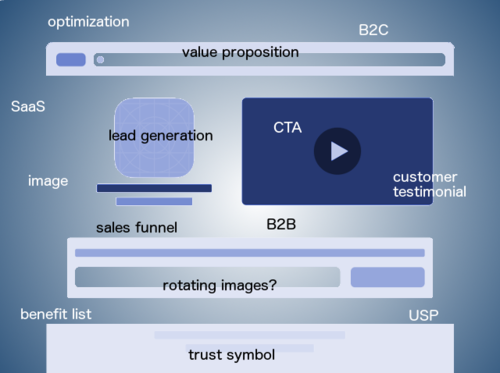 Any good landing page builder should make A/B testing your page a cinch. Now, you might think that these small changes can’t actually meaningfully influence your landing page’s conversion rates. I’m here to tell you they absolutely can - and are more than worth testing even if you don’t believe me. I’ve said many times in other articles, as well as the complete guide to landing pages, that you should keep your landing page simple and to-the-point. Keep your image and USP front and center, and your variables separated and distinct. How you write - how you express your sales points in your landing page - is as important as anything else on that page. People don’t actually read every word on your landing page: they’re looking for the single thing that sets you apart from your competitors. They’re looking for the thing that makes them say ‘Sold!’ and click through. Keep your landing page simple: Provided you have an excellent toolbar at the top of your page that links to relevant pages throughout your website, you don’t need to include a huge amount of information on your primary landing page. Keep it simple. Keep it short. Keep it clear. Use simple language: Unless you’re using jargon to create a personable and inclusive page (see below) I recommend you keep your landing page language simple and easy-to-understand. Gauge your target audience: Is there a level of understanding and vocabulary you can assume or will a certain lexicon exclude first-time-buyers? Test this for yourself! Your landing page needs to be focused not on how awesome your business is, but on how awesome you can make your clients. It’s about them. Yes you need to sell yourself, but sell yourself in terms relevant to them. There are many tactics to do this (including my first strategy above, in which you tell site visitors what they get rather than what they should do). But there are smaller, subtler techniques that communicate your business as customer-centric. There are things that your audience may not even consciously notice that nonetheless gives them a feeling of inclusiveness and friendliness. “Save your time and your sanity”. Immediately the landing page visitor is thinking about how this tool can help them. It’s not really even about how amazing Hootsuite is - but how useful you will find it. For a closer look at selling to your audience without being too pushy, check out my article “Landing Pages: How to Sell your Product without Selling your Product”. Just as you prioritize SEO when creating content, prioritize SEO when writing your landing page copy. SEO is a complex series of strategies and tactics that are developing on a monthly and weekly basis. Just because the strategies I’ve given above work now doesn’t mean they’ll work in a month’s time. Keep up to date with what Google likes to see and change your landing page accordingly. And if you want to skip to the front of the line and check out some landing page templates that are already optimized for conversions (and some other cool stuff as well), check out Wishpond’s landing page builder. Hopefully you now have a better idea of how the small changes in language can have a positive (and negative!) effect on your landing page conversions. Ensure your landing page is personable by using personal pronouns, telling a story, including customer testimonials (with a headshot) and making the value of your business all about your customer. Have you noticed any small language changes having an effect on your landing page conversion rates? Have you ever A/B tested your CTA button text? Let me know your story in the comments below! To download our complete guide to everything you need to know about landing pages, Click here.